It was an extremely fast-moving (7.8 km/s = 5 miles/second) and dim (M+7) object. You would’ve needed a telescope (or very good binoculars) to see it. Even then, you couldn’t see it from many locations (Europe and western Asia were good). There was no chance it would hit the Earth. 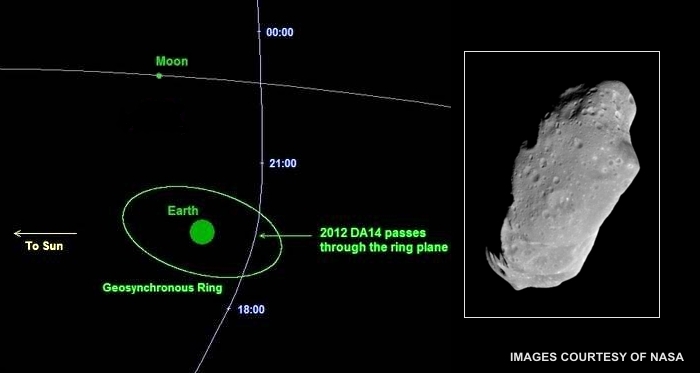 The graphic above shows the path of asteroid DA14, estimated to be about 50 meters (165 feet) in diameter, with a mass of 130,000 metric tons (130 million kg). DA14 passed within 24,000 km (15,000 miles) of Earth at its closest approach. That’s even closer than the geosynchronous satellites we use for communications. Those satellites orbit at 36,000 km (22,000 miles) altitude, and their orbit is shown in the graphic as the geosynchronous ring. We have no good photos of DA14. The inset shows another asteroid, named 99942 Apophis. The number before the name designates the order of discovery, so Apophis was # 99,942. So yes, there’s lots of them out there. Close to a hundred thousand have been identified, named, and assigned a number. Astronomers say we’ve found 99% of the big ones with diameters greater than 100 km, and about 50% of those in the 10-100 km range. There are millions out there, but the smaller ones (like the Russian meteor last week) are virtually impossible to locate and track. Apophis passed within 14,000,000 km (9,000,000 miles) of Earth in January 2013. It’s much larger than DA14, with a diameter of 350 meters (1100 feet). Still, the image shows what most asteroids look like — irregular cratered bodies made of rock, metal, and probably some ice. Their orbits are easily changed by the gravity of major planets and moons. This is called a perturbation: It changes the asteroid’s orbit in a way that necessitates recalculation of future orbits. And DA14 was definitely perturbed as it passed by Earth on this orbit. NASA JPL has created a video animation simulating the Feb 15 encounter. This post was written two weeks before DA14 passed Earth, but I had confidence in the prediction that it would miss us. Its orbit has been carefully scrutinized by astronomers charged with tracking these things. If it did hit us (which it won’t), the impact energy would be about the same as a 2.4 megaton explosive. By comparison, the atomic weapon detonated above Hiroshima in 1945 had a yield of around 13 kilotons. 2.4 megatons is 180 times 13 kilotons. So DA14 could take out a large metropolis with a direct hit, but would not present a global hazard. And since the Earth is 71% ocean, all we might get is a tsunami (not like they don’t present their own hazards). There’s been a lot of “doomsday talk” in the popular media lately, so let’s set the record straight on at least this issue. Astronomers are tracking the really big objects that could pose a hazard to Earth. See, for just one of many examples, the University of Arizona’s Spacewatch Project. The most recent deflection strategy being investigated is the use of lasers to vaporize an area on the asteroid’s surface, which would create a thrust that can alter its course. See what the Planetary Society says about this approach here. Of course, there might be an asteroid out there with our name on it, but it’s nice to know the astronomers have our backs.